Myosource Kinetic Bands are used by gymnast for rings training. The rings require a gymnast to use many of their muscles simultaneously and resistance training allows a gymnast to train the muscles just like they will perform which will help them work together during a rings routine. Gymnasts are able to put the Myosource Kinetic Bands by placing the straps above the knee and then connecting the resistance bands. A gymnast will build great explosive strength in the core and lower body as well as the upper body by performing dips and pull ups on the rings. Pushing down on the rings, shooting out of a handstand and into a handstand, quickly turning over, maintaining pressure on the rings, turning the rings, stabilizing the rings, balancing the body, inverted hangs, tucks, back levers, and front levers are just a few of the skills that require powerful quick twitch muscles to be competitive with great form. A gymnast must have extensive upper body strength and core body muscle strength. Myosource Kinetic Bands pinpoint muscle development that it takes for gymnastic rings explosiveness. Resistance bands are great for gymnast’s to perform repetitive moments on the rings while increasing the durability for gymnast’s to remain in the air connected to straps. All the muscles of a gymnast have to be used simultaneously to remain stable and balanced. A lot of people don’t think of the men’s events when they think of gymnastics. The women tend to get all the attention, but the skills and strength of men’s gymnastics is huge. 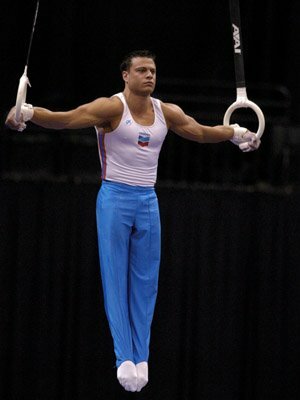 The conditioning and training that men go through in preparing to perform a rings routine in gymnastics is very intense. The rings gymnastics event is for men and requires strength skills including stability and balance. The rings hang from a stand and are 300 cm long. When a gymnast has to swing up to a handstand it takes tremendous upper body and core strength. The back has to also be strong in order to give support for pushing upward while maintaining body control. Too much arch forward or backward will cause the gymnast to lose their control in holding their stability positions. A gymnast performs lots of body swings and hand rotations. The number of lifts and turns takes a toll on the shoulders and arms so they must be trained to endure the stress. Often a gymnast wants to quickly learn a technique or skill and move on to the next. The skills required in a great rings routine take a lot of time to master. It is not easy to maintain tension on the rings throughout the entire routine. Gymnasts also have to perform skills like the Flyaway that requires them to release the rings with a fast turn. This requires a gymnast to let go of the rings, turn quickly and immediately get back down to grip the rings while getting great height off the rings. A gymnast upper body workouts and core workouts are very intense because the stamina and strength that a gymnast needs to perform on the rings requires great muscle explosive strength and acceleration. Gymnastics Rings Timing: Timing is a vital aspect of each and every move when performing a gymnastics ring routine. This is a skill that separates the mediocre from the elite. Timing is involved in transitioning from one move to the next and is the difference in hanging on or falling. The moves that a gymnast performs on the rings progressively get more difficult as a gymnast advances and without proper timing the hands will not be able to stop and start quickly. Myosource Kinetic Bands provide the ability to increase resistance to build quick fast twitch muscles so that they react and contract quickly to improve timing in a gymnastics ring routine. A gymnast must be quick to move from one move to the next. Moves that involve the heels being driven towards the roof require quickness. If this type of move is slow a gymnast timing will be off and cause point reductions. Timing and Quickness will determine the smooth transitions from move to move. Gymnastics Rings Balance: Think about it. It takes incredible balance to hold on to the rings with one hand and arm while the legs are elevated and parallel with the ground. Balance in a gymnastics rings routine is important is being able to still the rings and keep them still while performing a move. Gymnastics Rings Strength: Resistance bands enable a gymnast to build explosive strength and power to maneuver and perform on the rings. A gymnast does not get to utilize momentum and build up in every move on the rings so they rely on their strength to get into the correct position. Holding a move for two seconds may not seem like a long time, but a rings move requires a gymnast to completely hold his body weight in ways that are not normal. Some of the names of rings moves and skills are named for the strength that they require. Fly away, muscle up, back up rise, press to a handstand, shoulder stand, shoot to a handstand, L support hold, back press, iron cross, double layout, and front giant are a few of the strength moves a gymnast performs on the rings. Starting from a dead hand and going into a move hanging from the rings, even with the rings, or above the rings takes more strength then people realize.